According to UNESCO, “radio is possibly the most important medium of communication in developing countries because it is an affordable, portable source of real-time information. Information that can facilitate the empowerment of vulnerable communities who are isolated geographically, culturally or linguistically and whose representation is generally ignored by mainstream media. Local radio voices can be heard discussing health issues, education, gender equality or even disaster risk reduction.” Oftentimes, due to the lack of literacy in regions, radio is also the only means for these vulnerable populations to access vital community information. Angaza has partnered with manufacturers to bring radios to individuals living off-grid or with unreliable electricity through solar home systems and stand-alone accessory options. These solar home systems not only light up homes in isolated communities, but bring with them a wealth of information and resources via their radios. 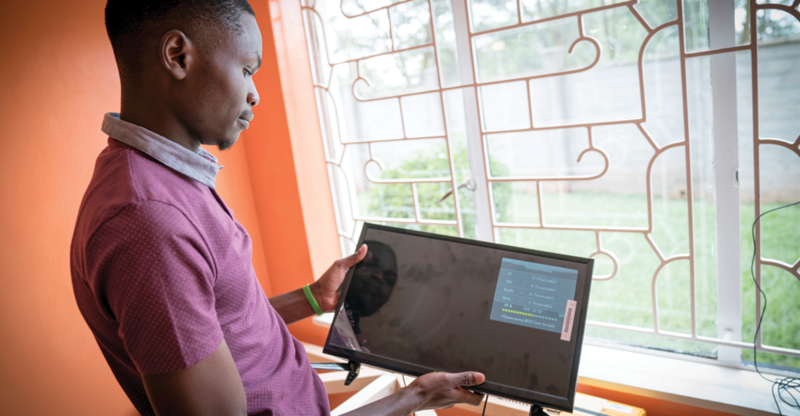 Angaza’s partnerships with Fosera, Greenlight Planet, BioLite, and Amped Innovation enable distributors to grant their end consumers a passport to information and entertainment, with affordable payment terms. The Fosera Radio 100 is a portable 88 – 108 MHz FM radio, 530 – 1600 KHz AM radio or 8 – 18 MHz shortwave radio that offers solar powered, energy efficient entertainment without compromising sound quality. With a 3.5mm auxiliary jack and built-in speaker users can choose to listen in privacy, or not. The radio can be powered by both Power Line LSHS and Blue Line Pico Solar Home System (PSHS) battery boxes, but also by any Fosera torch. If an internal battery for the radio is purchased, consumers can achieve even greater independence from the power supply. The portable battery can be charged similar to the battery boxes or torches. Because the radio is small in size and lightweight, it’s the perfect portable entertainment appliance. The Fosera Radio 100 comes with Fosera’s one year warranty. 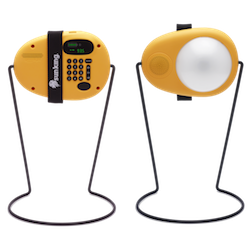 The Sun King Boom is a solar-powered lantern with a built-in 88 – 108 MHz frequency range radio with an internal antenna. And the digital FM radio has an internal memory to save the end users’ favorite 10 radio stations with numeric key input. The Sun King Boom comes with a powerful 3W, 85-90 db/W built-in speaker and an auxiliary earphone jack with volume adjustment up to level 18 so users can choose to share the news – or game – with a crowd or all to themselves. The Sun King Boom comes with Greenlight Planet’s two year warranty. The BioLite Home 620 solar home system features a built-in FM radio at its control box. The LED display and keypad provide maximum control over the system, allowing the user to scan through FM radio stations. With speaker-only integrated audio, hours of music, news, or sports entertainment can be shared with everyone. The BioLite Home 620 comes with BioLite’s two year manufacturer warranty. Greenlight Planet’s Sun King Home 400 solar home system includes a solar powered portable FM radio. 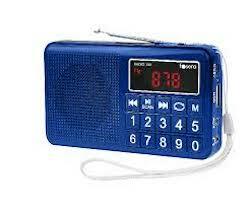 With a digital display and keypad, choosing or saving radio stations is easy. Users can choose between using the 3.5mm auxiliary headphone jack or sharing the entertainment with the whole room. And the volume controls are just a touch away. 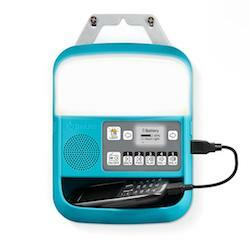 This sleek and energy efficient portable FM radio is a compact 120 x 64 x 30.5mm. The Sun King Home 400, with 19” 1080i high-definition display, provides the television and radio access needed for complete access to news, sports and entertainment. This solar home system is covered by a Greenlight Planet two year warranty. The WoWsolar 100 and TV versions of the Amped Innovation WoWsolar solar home system product line are enabled to support a radio to keep its users connected to information and entertainment. With two built-in 5V USB ports, users can easily plug in their battery-operated radios to charge. Amped Innovation also offers the opportunity to purchase a radio separately for use with either their WoWsolar 100 or WoWsolar TV solar home systems. Radio appliances come with an Amped Innovation two year warranty. Contact your Customer Success representative to learn more about selling pay-as-you-go radios on the Angaza platform.